I love Pizza. 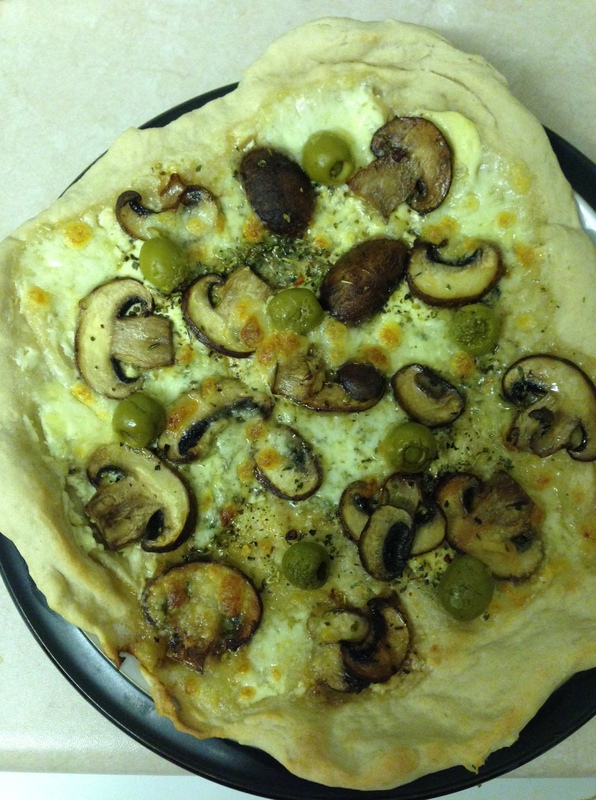 I love eating pizza and I love making pizza but quite often after a very busy day I really don’t have the time or energy to make pizza dough which doesn’t help me at all on the days that I really fancy a pizza. 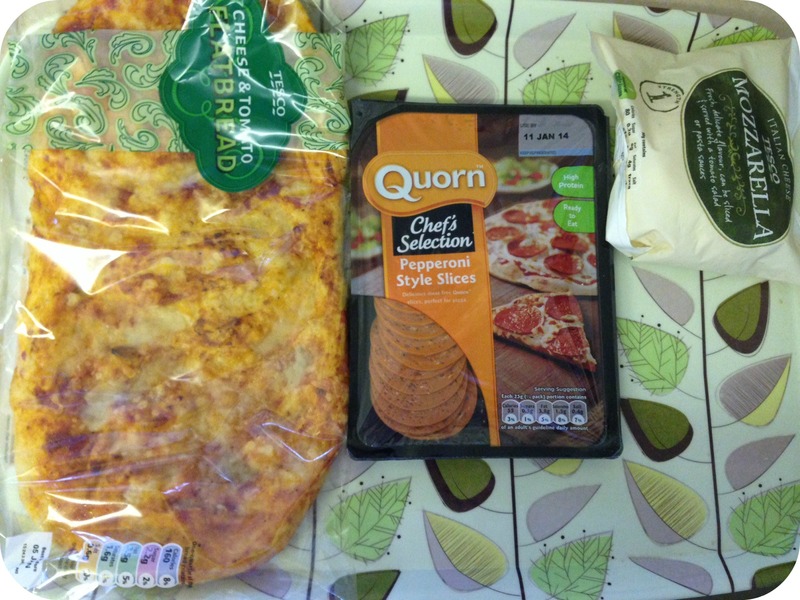 I managed to find a great alternative to my much loved pizza which requires only 3 ingredients, on this occasion the ingredients were purchased from Tesco and can be seen below. By using a cheese and Tomato flatbread I already have my base ready, a few slices of quorn pepperoni and mozzarella and it’s ready to bake in the oven for 5-7 minutes not the 12 that I left mine in for on this occasion. This is the perfect quick meal that goes from fridge to table in less than 10 minutes and even the busiest of person has 10 minutes. I’ve tried lots of different taste variations including using left over chilli, pasta sauce, chicken and sweetcorn, anchovy and olive, goats cheese and red onion and Chinese chicken and beansprouts. 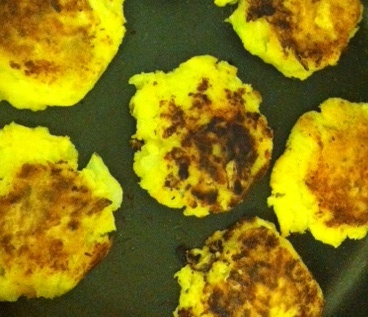 You can swap the base for crumpets, muffins, wraps, naan bread or even plain bread. 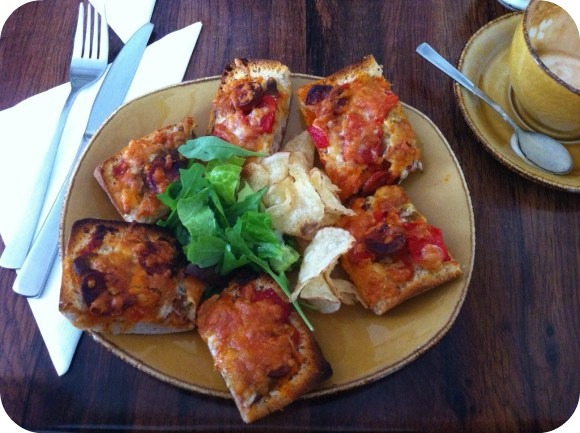 Who doesn’t love Pizza toast? Gusto Ricco is a bit of a tardis, it’s tiny from the outside but there is seating for many people inside although some of the tables are very close together. 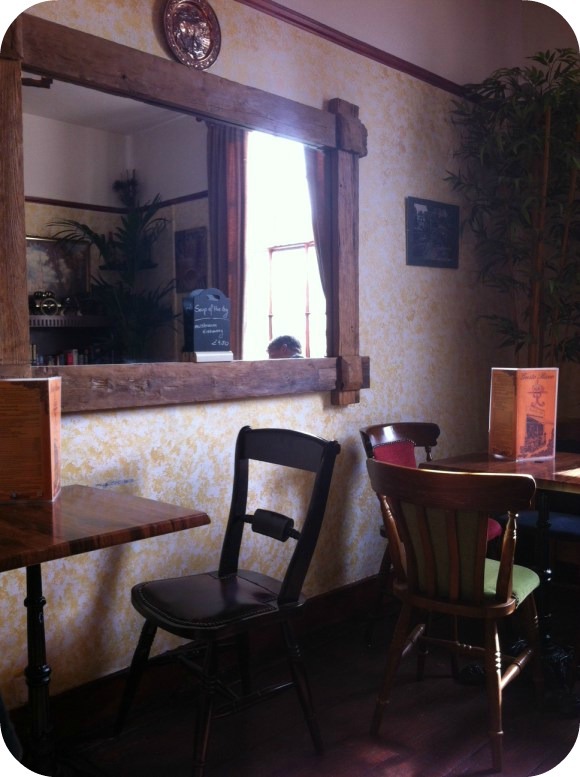 There is a very rustic feel to the cafe making it feel very authentic, the decor is very traditional with lots of wood. We climbed the stairs upstairs which would be a struggle for some people as they are quite tight and found a lovely little table for two in the corner. After browsing the menu I decided that I was slightly hungrier than I had anticipated and chose to have the Lasagna, on first glance I thought that the small brown bowl wouldn’t even fill a small gap but boy was I wrong! The Lasagna was filled with meat and sauce and was so delicious I can still taste the flavours. The pesto oil on top just added to the flavour and the chunk of bread on the side was fabulous for mopping up the juices left in the bowl. Mr Gourmand had polished off a huge breakfast a couple of hours earlier so Pizza Bruschetta was all he could manage however it was a much bigger portion than he expected. Layered with pepperoni, tomato and cheese and served with a simple salad and crisps it was definitely not a light lunch. Mr Gourmand was in a coffee kind of mood and being an Italian cafe the coffee was very good, just as expected and came with an amaretto biscuit which I was quick to steal as they are my favourite kind of biscuit. 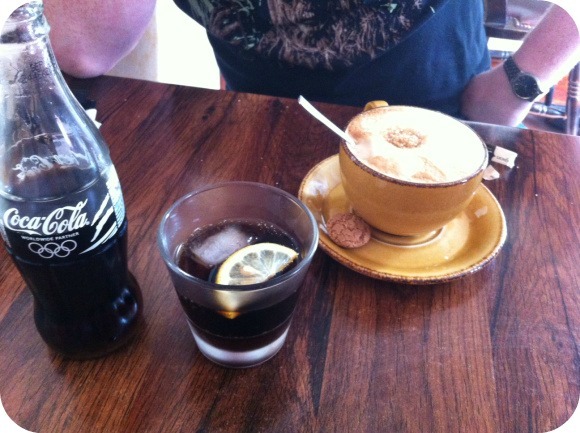 I had a bog standard Coca Cola which to my delight was served in a glass bottle – why does it always taste better out of a bottle? We will definitely be visiting this gem of a place again, there is no room for prams or pushchairs so Arthur will have to be worn in a carrier should we visit with him. 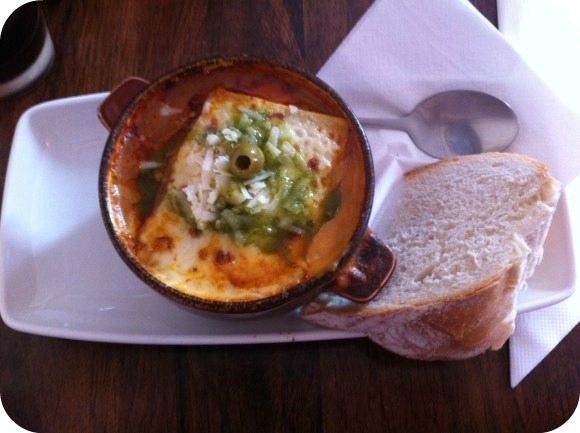 Gusto Ricco Cafe can be found at 65 Regent St, Town Centre, Leamington Spa CV32 5DX. 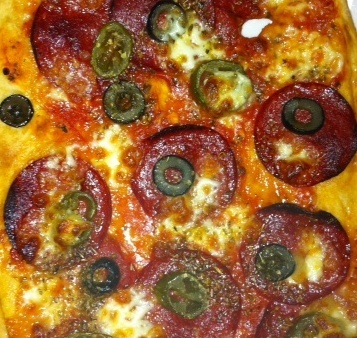 We love home made pizza, it’s quick and easy to make and costs considerably less than a takeaway or shop bought pizza. We all like different toppings so by making our own pizza we can pick and choose what to put on. Instead of the usual tomato base I decided to try Crème Fraiche mixed with a bit of garlic, I loved the creamy lemony taste this provided and it made a lovely change. Make your pizza dough and put to one side. Chop the mushrooms and fry in a little olive oil, while they are cooking stir the garlic into the Crème Fraiche. Roll out your dough and place on a baking tray (I use my Tefal Ingenio pan) cover the base with a thin layer of your Crème Fraiche mixture and sprinkle with dried herbs, place a layer of mushrooms on to the base and scatter on some olives. Top with ripped mozzarella and cook for around 10-12 mins until the base is cooked. Baby Gourmand didn’t get to eat any of this as the anchovy inside the olives were a little salty. Now Baby Gourmand is eating his meals with us I have been trying to find new ways to introduce different flavours to him, this pizza was received well by all family members so will definitely be getting made again. 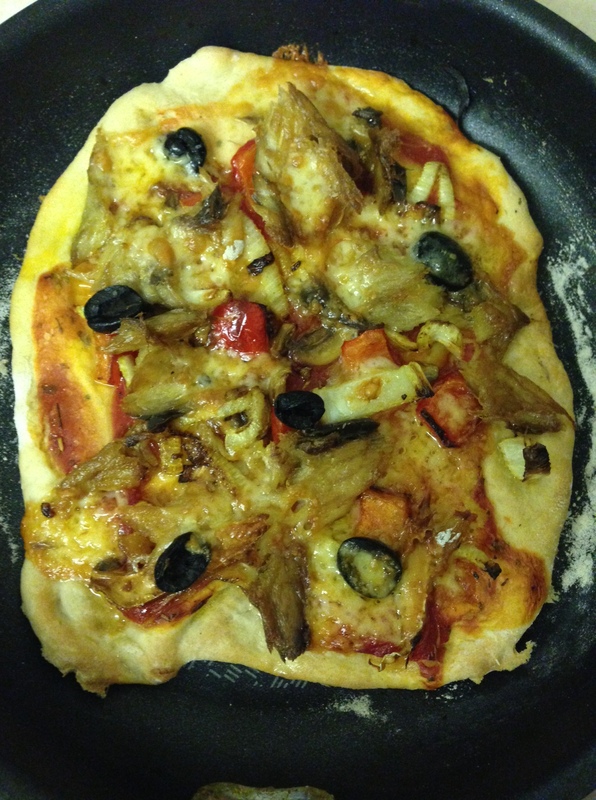 The pizza dough was made using this recipe from a previous blog post. I added some tinned chopped tomato with herbs to the base and topped that with mackerel, braised fennel, black olives and red pepper. When I went to the fridge for the cheese I realised I had forgotten to buy Mozzarella so had to make do with a mild cheddar which actually worked well. Baby led weaning definitely doesn’t have to be boring and bland, it’s so much easier making a meal for the family rather than cooking two separate dishes. 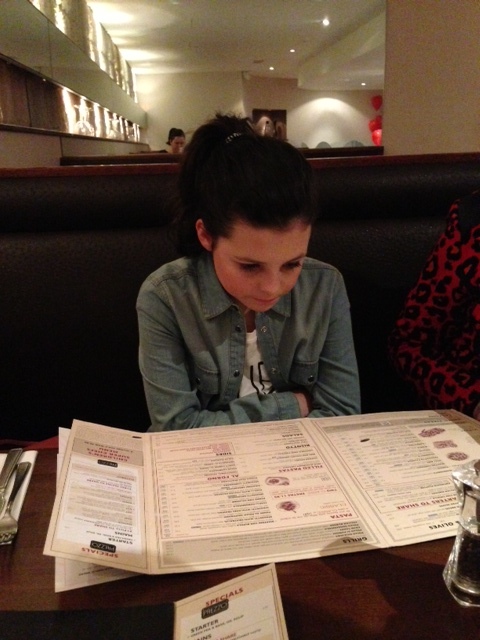 I was recently invited to Prezzo to sample their limited edition sharing menu which is available until 4th March 2012. Our waiter Peter could not have been more attentive and was happy to offer advice on the the meals available and his favourites, although he was quick to point out most meals were very good. The restaurant had a great atmosphere and was full due to it being Valentines Day, yet the Staff were very attentive, drinks were replenished when needed, empty plates were cleared quickly, and fresh courses brought out to eager diners with loved-up eyes and soon satisfied stomachs. 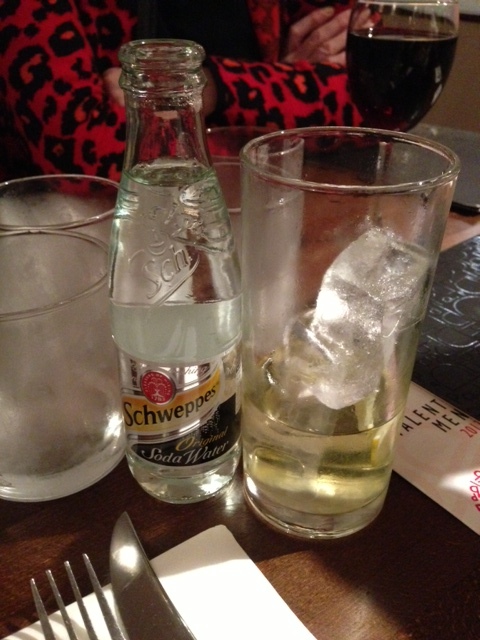 I was very impressed with small details like the chilled glasses, there is nothing worse than putting a cold drink into a warm glass. The soft drinks were served to the table in a glass bottle which I prefer as drinks seem to taste nicer when served out of an ice cold bottle. Mini Gourmand took her time perusing the vast menu, I would have probably ordered everything as there were some amazing sounding dishes on the but we decided that myself and Mr Gourmand would order from the sharers menu and Mini Gourmand and Grandma Gourmand would order from the main menu. We couldn’t quite decide what to order so we went for an appetizer to give us a little more time. Marinated Olives (£2.95) The mixture of green and black pitted olives were marinated in a mixture of garlic, peppers, herbs and olive oil. 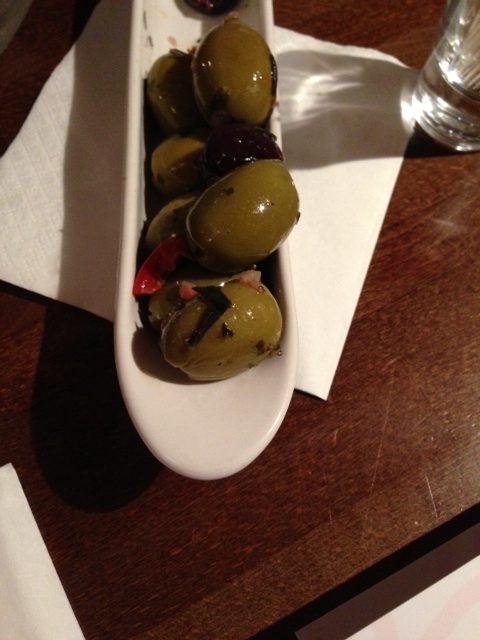 I found the green olives were very firm and juicy holding the flavours well. The black olives were soft and soaked up the delicious oil. I loved the contemporary bowl that housed the olives. The delicious olives gave our brains enough time to select the combinations of food we thought could satisfy our craving stomachs. The King Prawns (£5.65) were served in a spicy tomato sauce with just a hint of chilli which left a nice amount of heat in the back of the mouth. 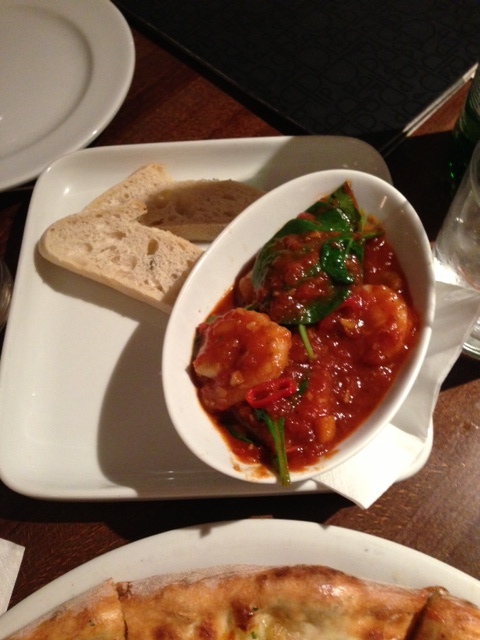 a sprinkling of spinach garnished over the prawns really complemented the dish. We shared a Pane Con Cipolla (£4.95) which was the perfect combination of thin base and soft and bouncy with a crispy crust thin base. 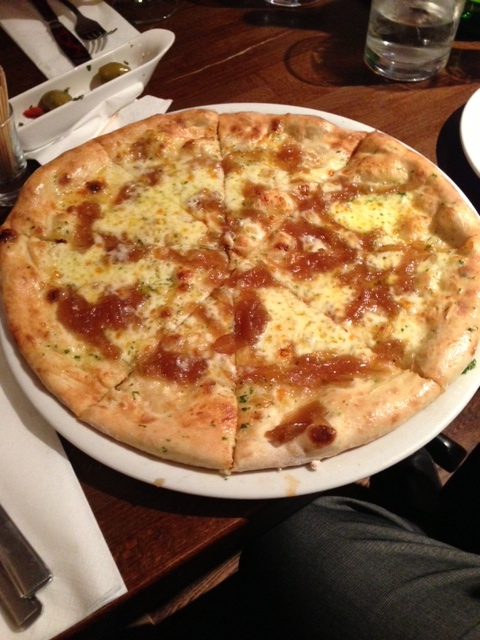 There was a perfect combination of cheese and sweet onion, the garlic not at all overpowering, and beautifully tangy. 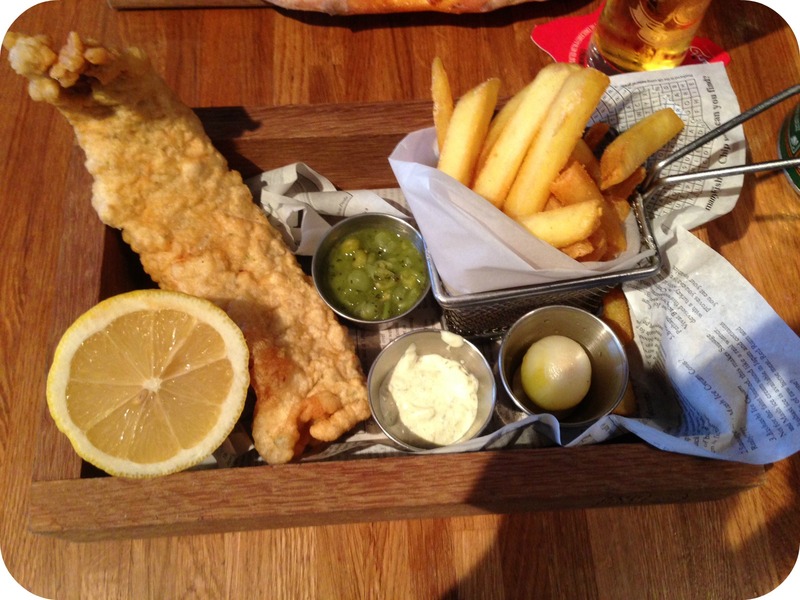 Mr Gourmand and Grandma Gourmand commended this as their favourite starter. 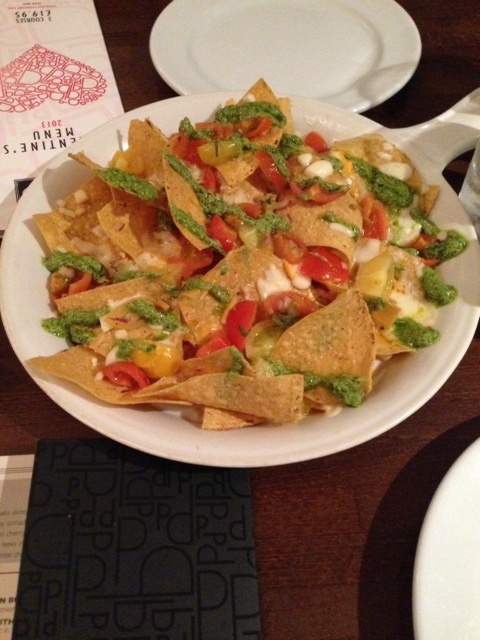 Next up was the Italian Nachos (£6.95) which mixed sweet and juicy red and yellow cherry tomatoes with smooth Pesto and just the right amount of basil to not be overpowering from. Mini gourmand devoured these. In my opinion I have left the best till last. 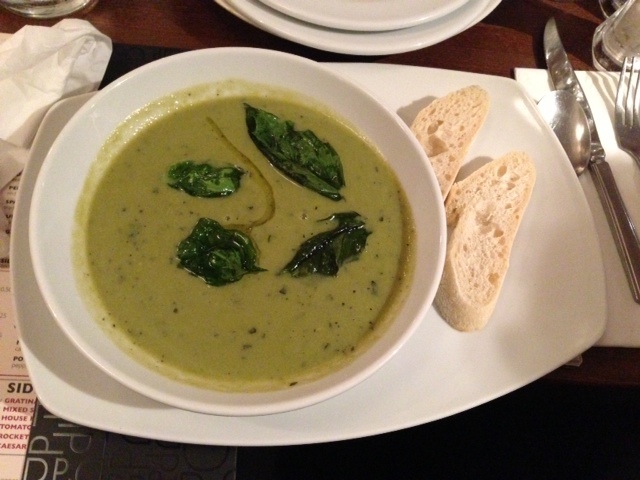 I ordered Green Pea and Basil Soup (£4.95) from the Sharing Menu. This was beautiful and creamy with a kick of pepper. There were so many different flavours in the soup which combined to create an amazing taste with a slight aniseed after taste which is really cleansing on the palette. The peas provided a different texture giving a combination of smooth and chunky at the same time which is very pleasing, a pleasing and perfect consistency. Probably the nicest soup I had ever tasted. Time for the mains. 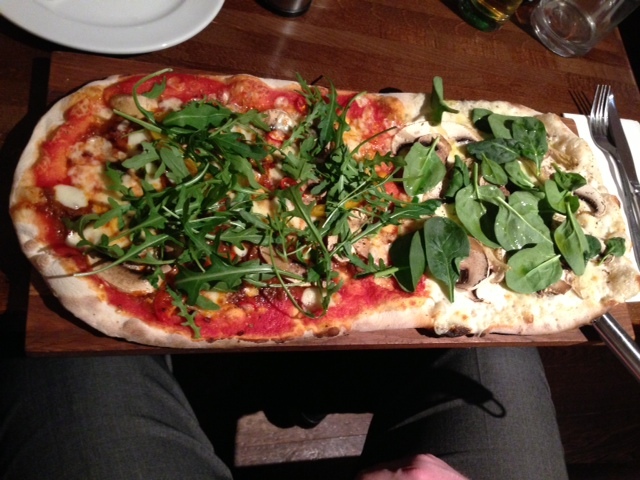 Now this was an interesting concept – a selection of sharing pizzas that offered contrasting and complimentary toppings. The Hot and Not (£16.95) was always going to be Mr Gourmands choice. The Hot side featured Bolognese sauce, red onion, roasted peppers, fresh chilli, crushed chilli, rocket and mozzarella The Not side featured white béchamel sauce, button, field and oyster mushrooms, spinach and mozzarella drizzled with truffle infused oil. The Hot Pizza had a beautifully thin base, a perfect ratio of meat to vegetables and a spicy heat that made the lips tingle. 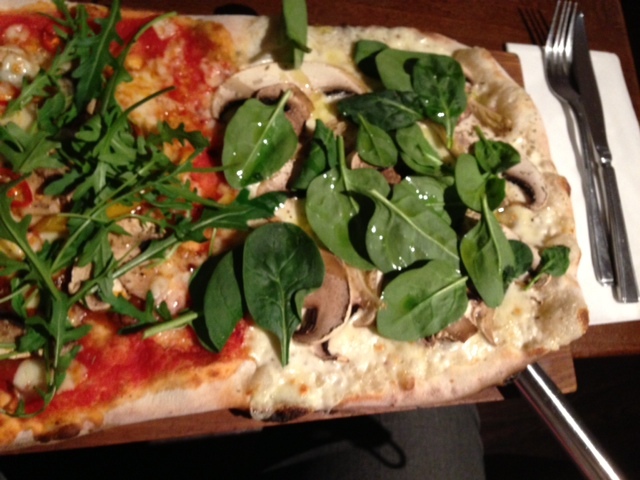 The Not pizza was very creamy and the mushroom texture was really gorgeous alongside the crispy base. The bechamel sauce was a lovely surprise and made a comforting change to tomato and worked extremely well with the mushrooms. The base was thin yet fluffy and the spinach gave the dish a very light taste which worked very well with the richness of the sauce. I ordered the Seafood and Meat (£17.95). The Seafood side featured king prawns, grilled artichokes, spinach, olives, fennel, tomato and mozzarella drizzled with a tomato chilli dressing. 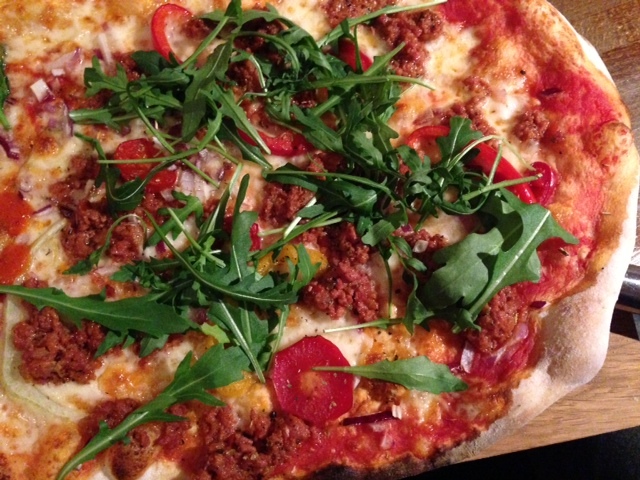 The Meat side featured spicy Italian sausage, roasted peppers, red onions, Roquito chilli, fresh rocket, tomato and mozzarella. 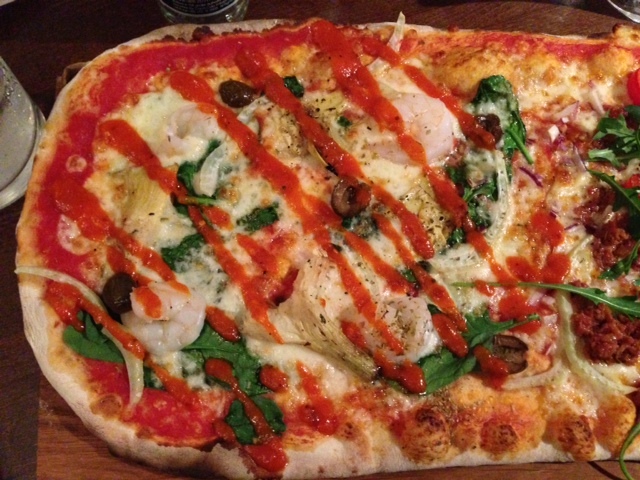 The seafood pizza had a lovely thin base with great kick from the tomato chilli dressing that permeated around the mouth. The fennel gives great crunch and artichoke added great flavour. 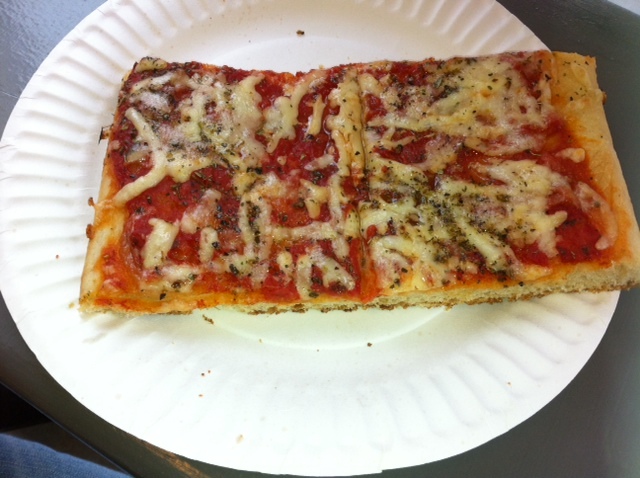 There was also just the right amount of cheese and subtle flavour of oregano which was common on both pizzas. 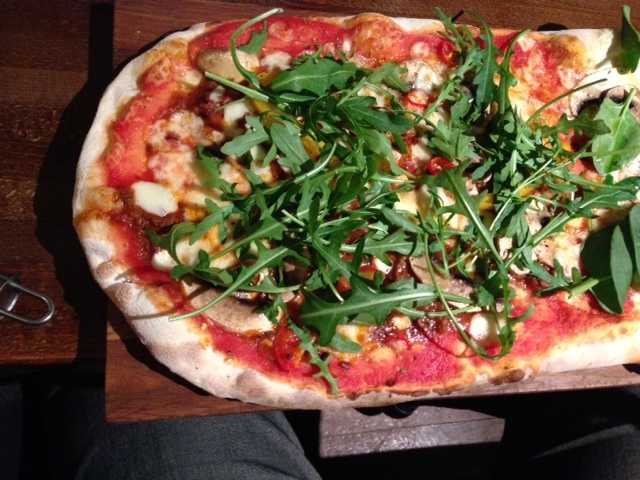 The Italian Sausage pizza had amazing fruity flavour from the peppers which gave a sweetness to the pizza. 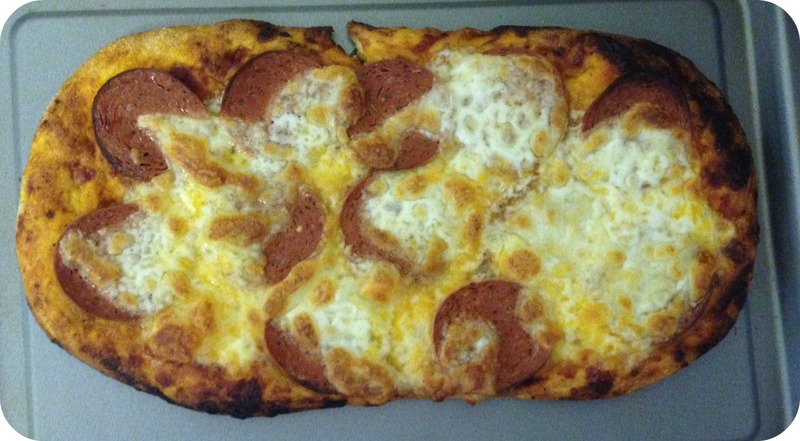 The dryness of the sausage was delicious making it more like a Mediterranean dish than a pizza. My only slight criticism was the Pizzas were rather difficult to cut on the boards even with the pizza cutter, you never really felt like you were cutting through it. I would like to mention that even after the pizzas had cooled down not one had gone crispy on the bottom, they were still a perfect texture. 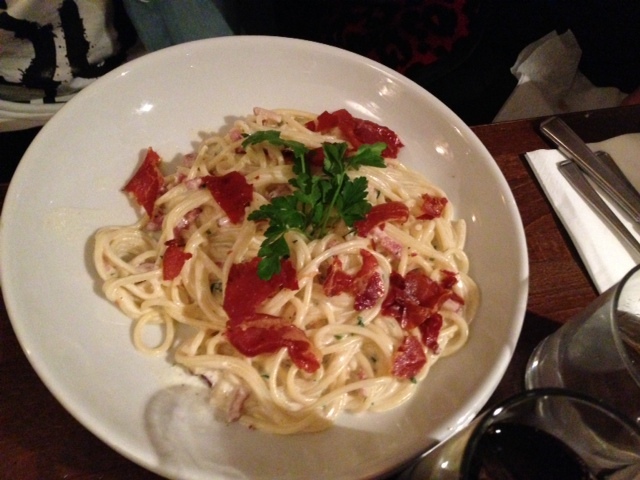 Mini Gourmand ordered The Carbonara (£9.15) which unusually came with crispy prosciutto which was delightful and gave this dish a much more expensive and exotic flavour than when it is prepared with the usual bacon. The cheesy sauce was particularly tasty and had a great smokey taste that seemed infused with the pasta. Mini Gourmand polished this meal off without much help, and believe me when I say this, she knows a good carbonara , and the sparkling plate she left was testament to this. Grandma Gourmand opted for the tried and tested Spaghetti Bolognese (£8.95), which although quite safe in terms of choice, is a good gage for Italian expertise as they can be bland. A perfect sized portion of delicious soft pasta was presented with good sauce to pasta ratio. 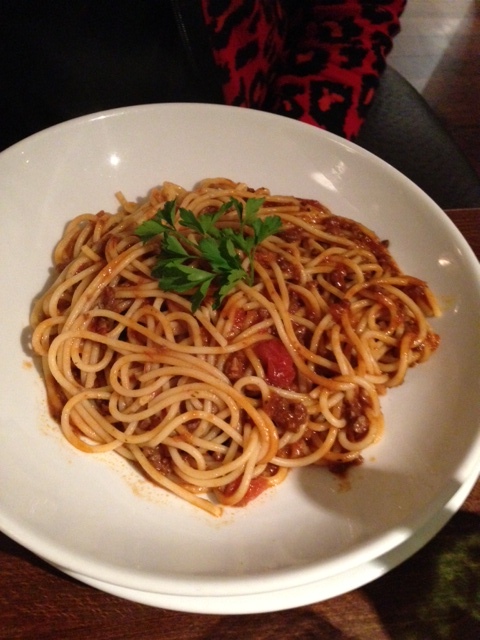 The Bolognese consistency was described as perfect with a lovely meaty taste. Mister Gourmand is a man of few words, I now see where he gets this from. Everyone was so full after their starters and mains courses that deserts were never going to be ordered, thirty seconds later we all had a change of heart…..
We ordered a medley of starters from the coffee and small desert menu, alongside one desert from the main menu. We decided to share everything. 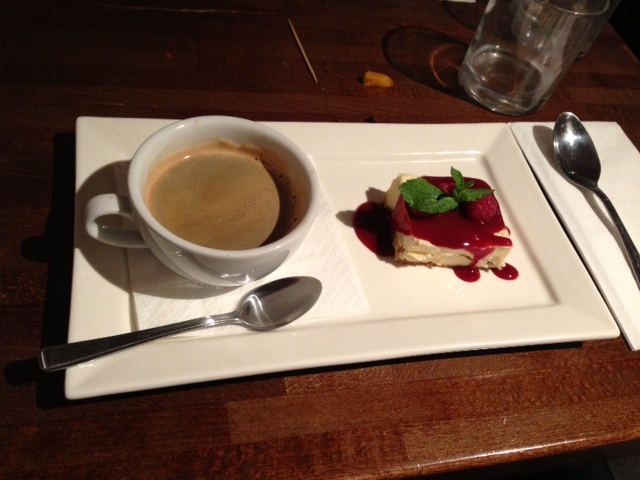 The vanilla cheesecake with coffee (£4.95) was covered with a raspberry coulis and fresh raspberries, the cheesecake was light and fluffy with a creamy texture, the tartness of the coulis was delicious alongside the sweetness of the cheesecake. 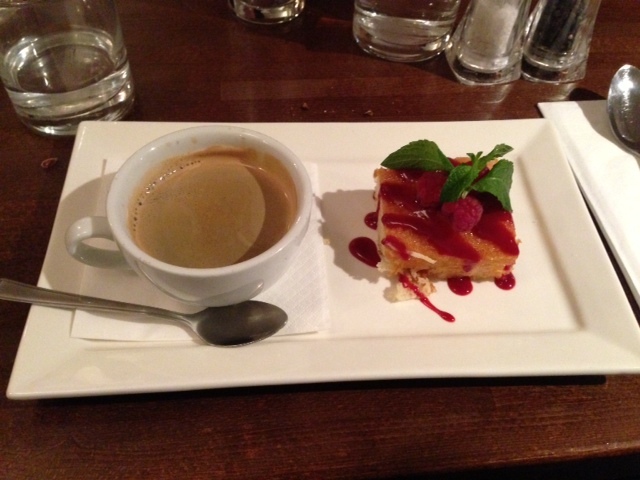 The lemon drizzle cake with coffee (£4.95) was light and fluffy with a sweet crunchy topping with an added tartness. The raspberries worked so well with the cake and added not only texture but flavour bringing out the lemony taste. 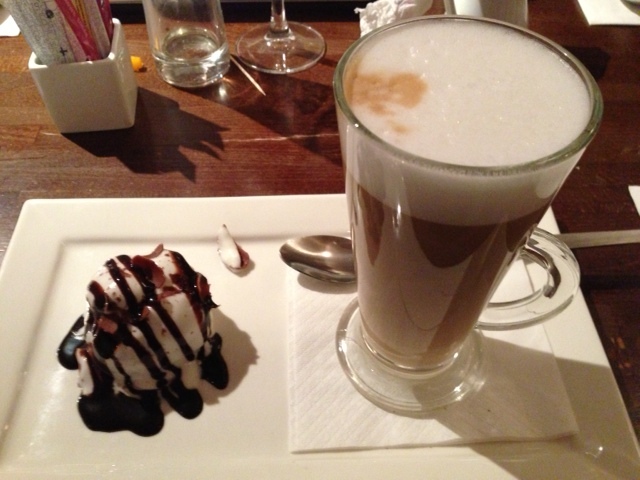 The profiterole with latte (£4.95) was like an inside out version of the popular classic. The filling was a chocolate cream covered with a vanilla cream and decorated with milk chocolate curls. A lovely combination and perfect as part of the coffee and cake option if you really want a desert, but feel like you can’t quite eat the full size version. 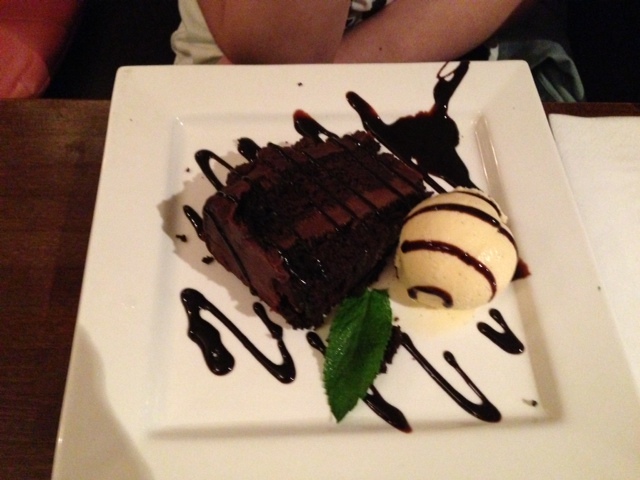 The chocolate fudge cake (£5.15) was sweet and decadent, the fudge filling was one of the nicest I’ve tasted. Having such a big slice of cake would be a challenge for anyone after such a huge meal, but Mini Gourmand managed to polish it off in record time! All meals except the two Spaghetti dishes and desserts were recommended by Peter for us to try to give us an idea of the variety of dishes offered by the restaurant. 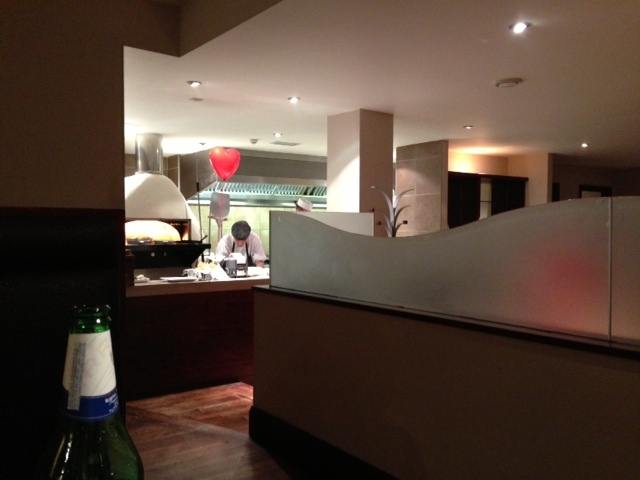 I would like to thank Prezzo Leamington Spa for inviting me to sample their menu, as always my review is honest and impartial and my opinion has not been forced. If you follow me on Instagram you will have noticed that over the past couple of weeks a large number of my photos were based on wholegrain meals this was because I had undertaken a challenge set by Mumsnet and Wholegrain Goodness to raise awareness of the benefits of wholegrains as part of a healthy balanced diet, and to inspire and motivate people to eat them. As a mother it’s very important to me that Lucie is eating balanced meals at home, she no longer takes a packed lunch as all of her friends eat from the canteen at school meaning that 5 days a week I have no idea what she is consuming (I imagine it is not healthy food). Trying to get Lucie to eat breakfast is a difficult task as she is always rushing however if I offered her a piece of chocolate cake or a biscuit she would probably snap my hand off! During my pregnancy I have made a conscious effort to eat breakfast (usually I would skip it). We always sit down together for our evening meal which except for the odd occasion is always prepared by myself from scratch so I know exactly what we are eating, I know from reading my blog most readers would think I eat out an awful lot but in all honesty I don’t and when I do it is usually on a weekend after 5 days of healthy eating. The challenge lasted for two weeks, from Mon 21 Jan to 3 Feb 2013 and was to include wholegrain in one meal or snack for the family per day for two weeks, using a variety of wholegrain foods available. My first step was to find out what a wholegrain actually was so I headed to the Wholegrain Goodness website to get some information. 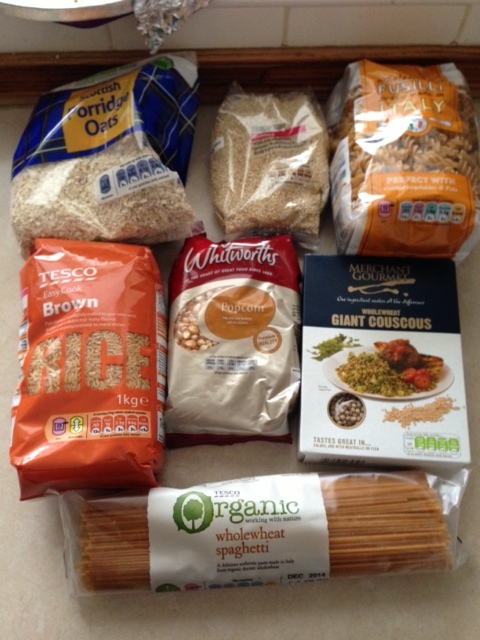 I headed to Tesco with my £10 gift voucher a picked up a variety of wholegrain foods, I already had some wholemeal flour, wholemeal self raising flour, wholegrain crackers, oats and noodles in the cupboard. 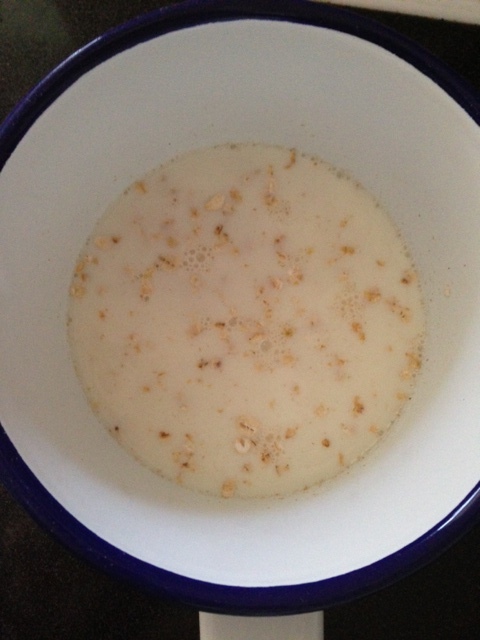 My next plan was to try and do some meal planning, I had already agreed that I would have porridge for breakfast most mornings and I would bake a loaf of wholemeal bread every couple of days rather than buying shop bought bread for snacks and sandwiches. For 10 of the 14 days I ate porridge for breakfast, I found it to be very filling, adding different fruits each morning ensured that I didn’t get bored of eating it. 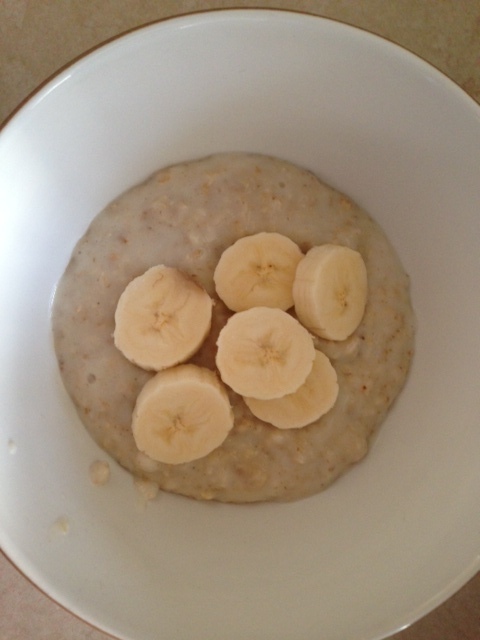 My favourite Porridge was with some chopped banana. Even when I woke her up earlier than normal I couldn’t get Lucie to eat a bowl before school as she always said she wasn’t hungry. Making my own wholemeal bread was simple to make by hand and tasted so much better than store bought. On the days that I didn’t eat porridge for breakfast I had toast made out of my bread. I managed to get Lucie to have toast on 6 out of the 14 mornings although on 4 occasions she took it into the car to eat rather than eat it in the house. 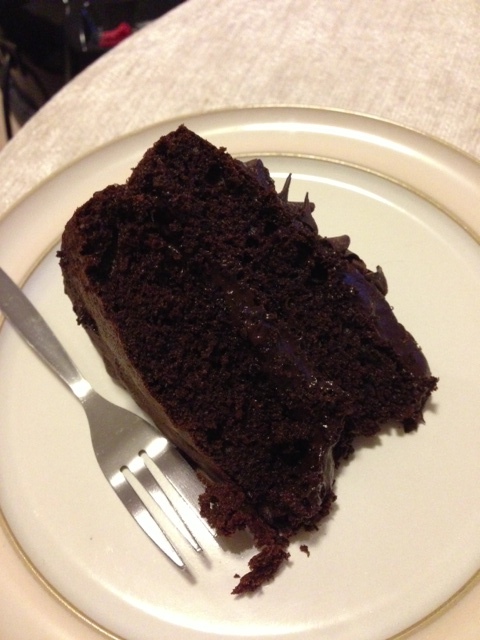 Whilst looking through the cupboards to see what wholegrains I already had, I came across a bag of Allinson wholemeal self raising flour so decided to make a chocolate cake to have as one of our snacks. After posting my photographs on instagram I had a number of requests for the recipe which I will be posting to my blog in the future. 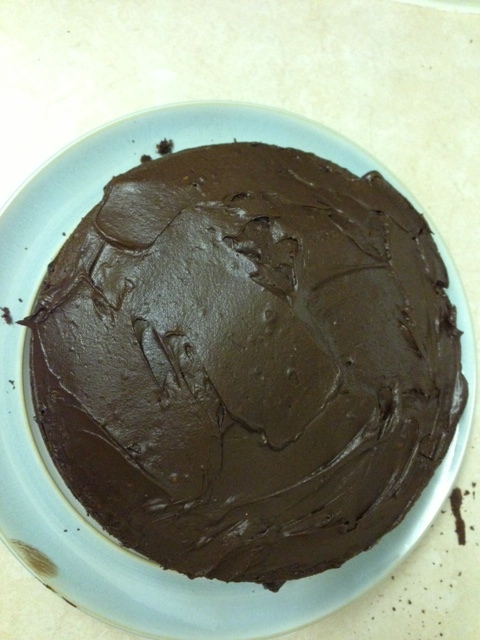 The cake didn’t rise as much as it would have done if made with a white flour, it was a little dense and only stayed moist for 2 days before cream was required but I was very happy about how this turned out. Using the same recipe for the cake I made a batch of Chocolate cupcakes which also served as snacks. Flapjacks were the next snack for me to make, I actually made a few different variety of flapjack including plain, raisin and dried apricot. 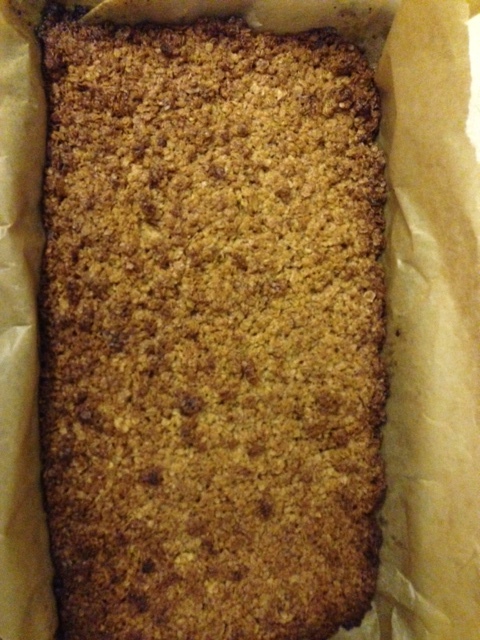 The three tray bakes of flapjacks made enough to last the full 14 days. Using a non stick pan with lid I successfully managed to make popcorn using no oil, butter or sugar. Instead of Lucie grabbing a chocolate bar, biscuit or crisps after school she had a small bowl of popcorn as a snack. 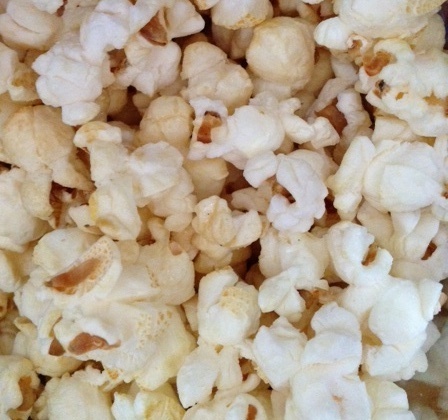 I was very surprised at how easy this was to make, it did need to be watched like a hawk in the pan as a couple of seconds too long made the popcorn burn, I found it easier to do small batches at a time. For 11 out of the 14 days I had either wholegrain crackers, wholegrain bread or cous cous with my lunch, a friend joined me on 8 of these days. Lucie had sandwiches made with wholegrain bread on 4 of these days. Incorporating a wholegrain into our evening meal was so much easier than I had initialy thought it would be. Lucie did complain on a couple of occasions that she didn’t like the brown rice however this did not stop her clearing her plate, not one of us could tell the difference between wholegrain pasta and white pasta and my pizza made with wholegrain flour went down just as well as the ones I make using white flour. 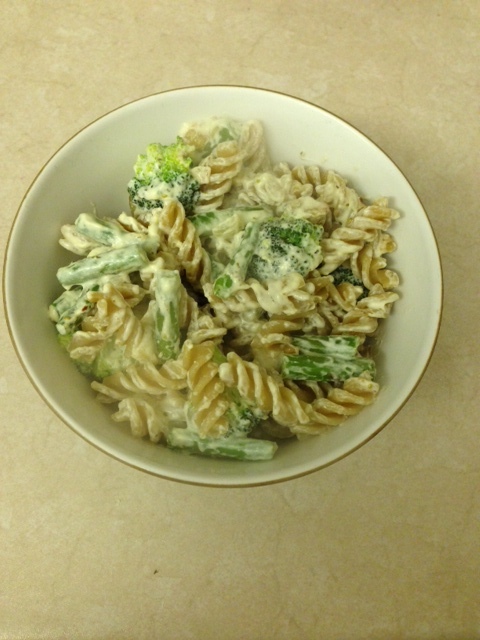 Lucie’s favourite dish was this Whole meal pasta with broccoli, green beans and asparagus with a touch of cream cheese, she loved it so much it was requested on 3 evenings! 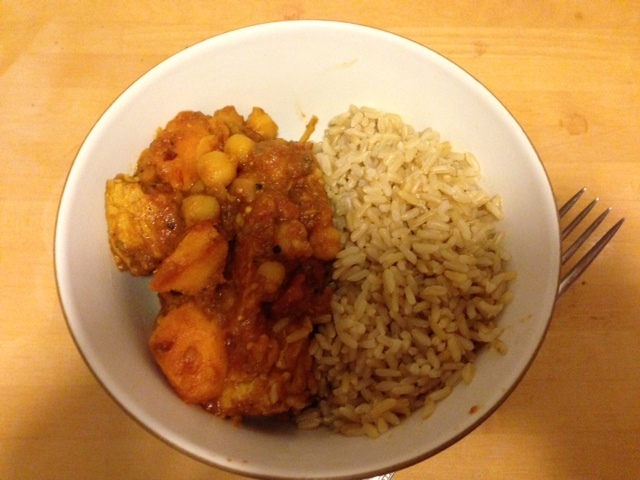 We had this Chicken, Sweet potato and chickpea curry with brown rice on two different evenings, I found the brown rice gave the dish a nicer texture and I really liked the nutty flavour. 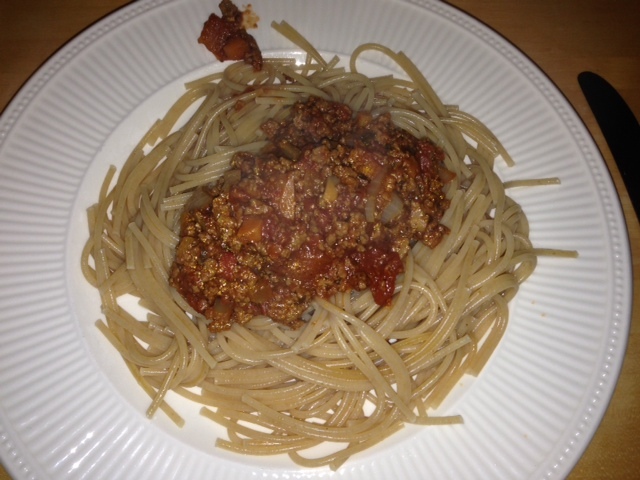 I made Spaghetti bolognese twice using quorn mince and brown spaghetti, this was a big hit in the house so I then made it a third evening using brown pasta baked in the oven with mozzarella cheese. 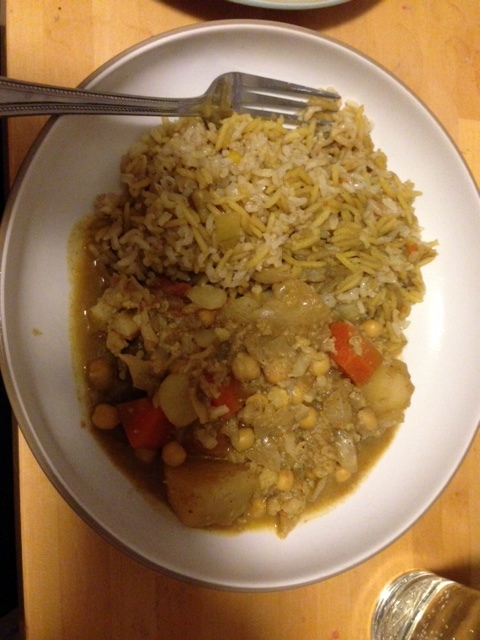 We had a Chicken and Veg curry with mixed brown rice one evening which was delicious. On two occasions I experimented with a wholemeal flour and polenta pizza base which went down very well with the family, I served this with cous cous salad just to add an extra bit of wholemeal into the diet. After eating wholegrains for 14 days I have decided to switch my white rice and pasta for a wholegrain variety and to incorporate more cous cous into our diets. I will try to use wholegrain flour whenever possible and will continue to make my own bread and snacks. Do you eat wholegrains as part of your diet? After reading this do you think you may be persuaded to switch? I recently received a Gourmet Garden product pack so I could enter the Blog Off / Cook Off competition which challenges the blogging community to show off their culinary skills and create fabulous dishes with Gourmet Garden. Even the most mundane every day recipe can be livened up with herbs and spices. If my dish is good enough I might make it through to the London cook off final in early 2013 for a chance to win a trip to Australia and £3,000 fee to become a 12-month ambassador for Gourmet Garden. Rather than just cook one dish I decided to cook a 3 course meal for my family and let them decide which recipe used the herbs and spices the best and this would be my competition entry. My second dish and entry to the competition is a Chilli Chicken Pizza, this dish used the Chilli, Garlic and Basil provided. The Chicken was marinated for 6 hours before use so it could soak in the flavour and heat from the Chilli. Preheat oven to 220°C and preheat baking sheet. Sift the dry ingredients into a bowl and make a well in the centre of the mixture, add the olive oil and pour in 120 ml of warm water. Mix to a dough using a wooden spoon and finish off by using your hands. Transfer the dough to a flat work surface. Knead the dough for 3 minutes and until it is springy and elastic. Transfer the dough to a clean bowl and cover it with a damp tea towel. Leave the dough until it looks as though it has doubled in size. Place the dough on to a work surface that has been sprinkled generously with flour to prevent it from sticking. Knock all the air out of the dough and knead it for a couple of seconds to begin shaping it into a ball. Dust your rolling pin with flour and roll the dough out to a shape that fits your baking tray. Bake the pizza on a high shelf for 10-12 minutes. I used a light covering of my Tomato sauce, Chilli Chicken, Red Peppers, Mushrooms and Mozzarella Cheese and finished off with a sprinkle of Oregano. 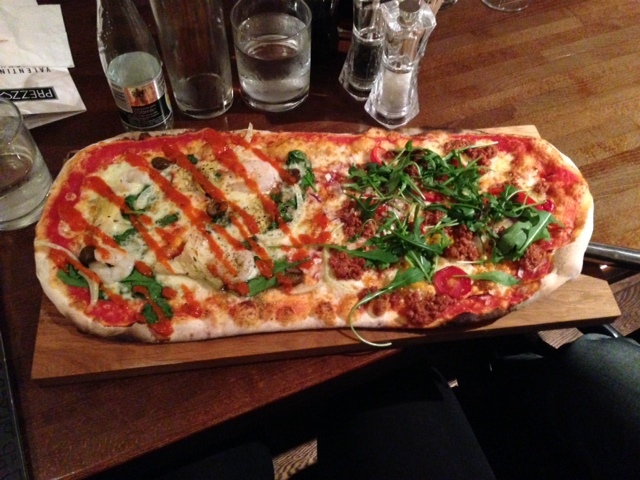 Pizza Al Taglio can be found at 34 Pilgrim Street, Newcastle upon Tyne. 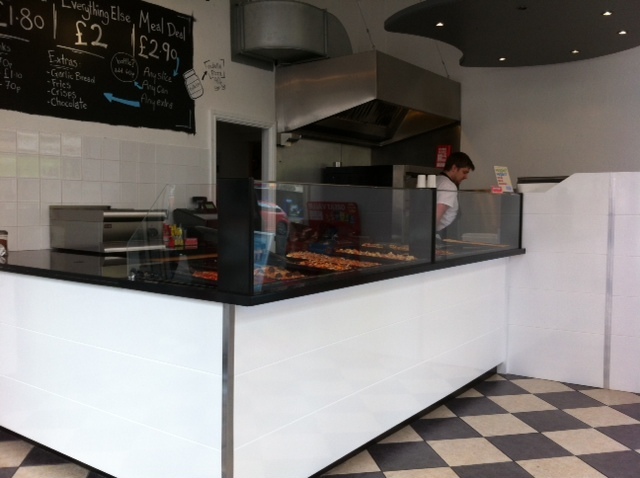 The chain opened in Durham in 2007 and the brand claim to bring authentic pizza slices to the North East. What you will notice straight away when you view the pizza slices through the glass is that the pizza’s resemble more of a french bread pizza rather than a traditional pizza base that is usually found in Italian restaurants. 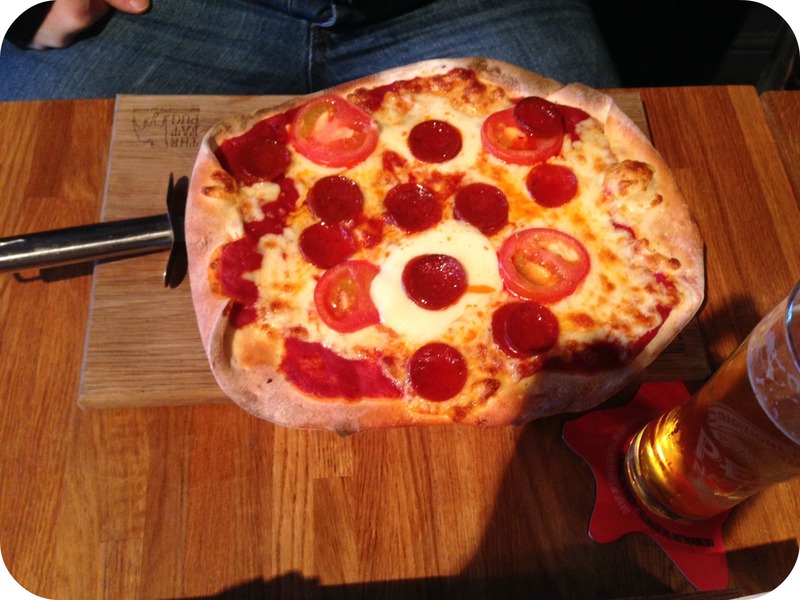 If you’ve ever tried to eat a thin based pizza on the go you will have realised that it quickly turns into a very messy meal, Pizza Al Taglio have formed the perfect base for a hand held pizza meaning that you don’t need to worry about a plate (a plate is provided but you don’t need one). I recently visited another pizza slice company in Newcastle and found that I had to fold my slice of pizza over to try to eat it in a ladylike fashion as the base was so thin, a knife and fork would have been prefered. Mr Gourmand ate his by holding the paper plate up to his mouth which isn’t ideal. The Pizza Margherita was a bargain at £1.80 per slice, the Margherita is a personal favourite of Mr Gourmand however I find it a little boring as a choice. I loved the taste of the herbs used on this pizza, I will choose my words carefully next time I call something boring as this pizza did not fall into that category. 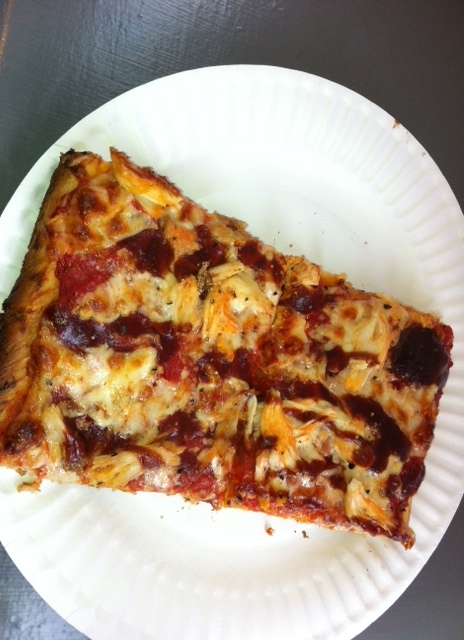 The base of the pizza was really good, different to anything I had eaten before but perfect for holding with your hand. 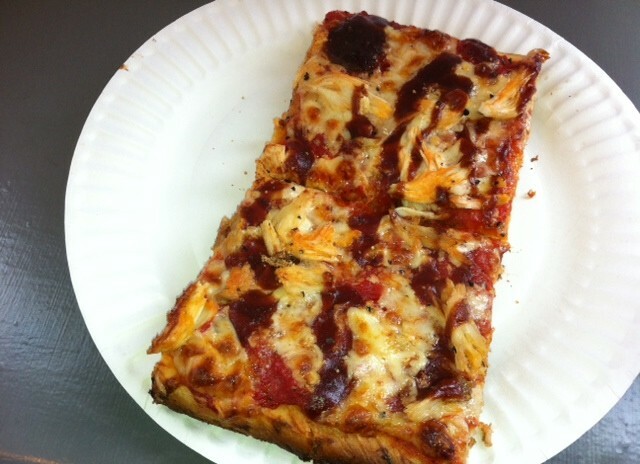 The BBQ Chicken Pizza was £2.00 a slice and packed with ingredients. The BBQ sauce was sweet and smokey and wasn’t overpowering as sauces often can be. There was a good amount of Chicken on the pizza and like the Margherita this pizza had a perfect base. If you’re looking for a snack that you can hold in your hand without needing a packet of napkins and you’re adventurous enough to try a base that’s different to the norm, pop down to Pilgrim Street in Newcastle and visit Pizza Al Taglio for a slice or two.